Today I bring you a sinister tale of La Dame d'Aprigny, an easily annoyed sprite of the long 18th century with a penchant for dancing. Though she makes the odd French-language appearance earlier, her first foray into English appears to have come in 1840. 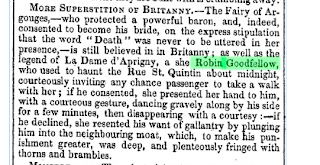 The Fairy of Argouges - who protected a powerful baron and, indeed, consented to become his bride, on the express stipulation that the word "Death" was never to be uttered in her presence, - is still believed in in Brittany; as well as the legend of La Dame d'Aprigny, a she Robin Goodfellow who used to haunt the Rue St. Quintin about midnight, courteously inviting any chance passenger to take a walk with her; if he consented, she presented her hand to him, with a courteous gesture, dancing gravely along by his side for a few minutes, then disappearing with a courtesy:- if he declined, she resented his want of gallantry by plunging him into the neighbouring moat, which, to make his punishment greater, was deep, and plenteously fringed with thorns and brambles." Materials for "Table Talk.". The Hull Packet (Hull, England), Friday, September 25, 1840; Issue 2910. British Library Newspapers, Part I: 1800-1900. 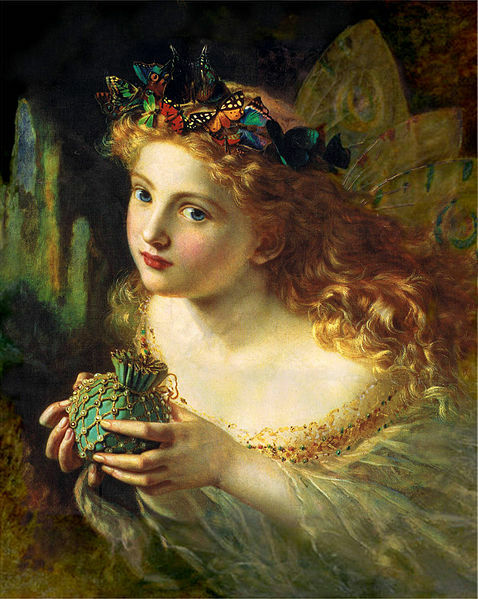 Is she any relation to that paradigm of French fée, Melusine?